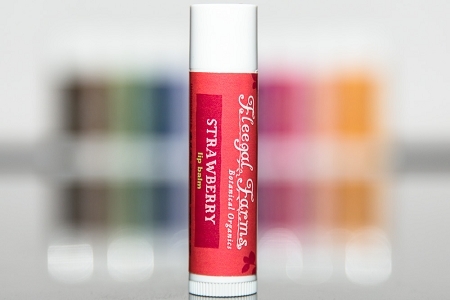 Lip Balm - 0.15oz Our lip balms contain no petroleum products, only vegetable oils to sooth your lips. They come in nine flavors: Lavender Hemp, Mint, Sweet Orange, Vanilla Spice, Strawberry, Coconut Lime, Honey Almond, Pumpkin Spice and Fragrance Free. INGREDIENTS: oils of olive (olea europaea), organic extra virgin coconut (cocos nucifera), flax seed (linum usitatissmum), castor (ricinus communis), shea butter (butyrospermum parkii), beeswax, candellia wax, vit e (natural tocopherol), zinc oxide, stevia extract (eupatorium rebaudianum bertoni), alkanna tinctoria root extract, organic and natural strawberry flavor.